Negros Daily Bulletin Editor Arman Toga got the president position in Saturday annual election of Negros Press Club set of officers for 2012 after getting a landslide votes against Aladdin Alas held at the NPC building, Bacolod City. Arman Toga will run the NPC, the oldest, prestigious press club in the country, with 154 current members coming from the print, broadcast and television networks based here in Bacolod City for this year's term. The other elected NPC officers are Edgar Lucasan, DyRL program manager as vice president; Clarence Locsin of DyWB-Bombo Radyo, secretary; Aquilino "Boy" Ciocon of DyRL, Treasurer; Chrysee Samillano of Daily Star, Auditor. While in the Board of Directors, which is composed of 5 members, the elected members were of Henceboy Cestina, Ranie Azue, Adrian Nemes, Merlinda Pedrosa, and Butch Bacaoco. In like manner, let's look forward for NDB Arman Toga for his planned projects for the NPC members' welfare. Congratulations Arman and more power. Congratulations to Arman Toga and the other officers! Hope this year will be a productive one for them. 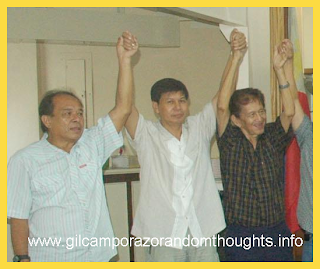 Congratulations to the newly elected offers of the Negros Press Club. I hope the projects set by the former president have seen fruition and I'm looking forward to hearing about new president's plans. :) Here's to the upholding of responsible journalism in the country! congatulations to him. i also like the 11 points of the former president, i hope the new pres. can continue it.